Have you ever taken time off to just enjoy the city where you live??? This is Part III to my season of birthday posts – I did say I was going to celebrate my birthday big time… I already revealed that the first part of my celebration was a quiet week exploring Berlin with my fella. Well the second half was was 1.5 weeks holidaying in London!!! What’s The Point Of A Staycation??? Well my Holidays Are… blog post championed the psychoanalytical benefits of taking a holiday – in it I mostly advocated “getting away”. This is the flip side to my call for taking time-out: staying put in the city where you live. Inspired by my two buddies Demarco & Tiffany who were visiting from Atlanta in the USA, I thought I’d extend my planned 1 week holiday in Berlin by another 1.5 weeks host them – hang out in London, do the tourist thing etc. A stay at home holiday is often referred to as a “staycation.” Great term! After the past 1.5 weeks, I’d call mine a blast!!! Friend’s birthday drinks: My mate Ezza had birthday drinks at a Grand Union bar that I have driven past many times and thought: oh-please – glorified pub. In the spirit of celebating his birthday though, I took my visitors and was pleasantly suprised! Very ‘young’ energy, cool music, kitch decor and the most hidden treasure of a garden – much bigger than you’d imagine from outside, full of Japenese night lights, tree-hut-inspired alcoves, sofas and benches, all with 20-40-somethings drinking, laughing and chilling. Of course our crew had to get up and get the dancing started! 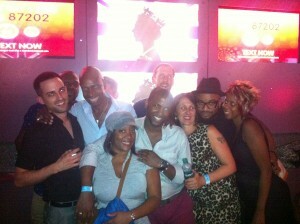 My Birthday Party: iCant tell you how I’m still buzzing from my party! 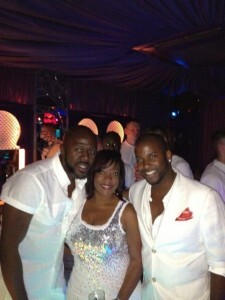 It was a wear white theme – everyone participated! I took over the Penthouse of a Soho bar, armed with my own DJ and the spirit to bring all of my friends – from nursery-age till present, together in celebration of my life and all of our futre lives. The party did what it said on the tin. End of!!! Theatre: My mate was staring in the critically accclaimed Royal Shakespeare Company’s adaption of Julius Caesar – with an all-black cast, set in Africa. We went and were blown away by the energy – there’s nothing like live theatre. Nothing I tell you! I took my guests to meet some of the actors after the show. Tiffany got an ace pic! Museum: Two shocks in a row – yes – me, who sees “museum” as a swear word, was dragged kicking and screaming – literally by my fella – into the Tate Modern. I died with my eyes open for 20 mins or so until I saw a life performance in the Turbine Hall…very interesting…and yes, I admit – very entertaining! The London Eye: We had to do this! Not my first time but enjoyable all the same! It’s very refreshing to see London in an eye’s view. 30 mins of wonder and the bolt-on 4D experience afterwards is fun! Demarco & Tiffany’s Leaving Party: I gathered friends together on Demarco & Tiffany’s last night to say goodbye over drinks…we moved from chilled bar to a party bar, to an all night eatery in Soho…what a fun night!!! Garden party: Inspired by the sunny weather, my mate Junior got a few friends together to have a bring-a-dish garden hangout. Great food, beautiful garden, great company. Noice! 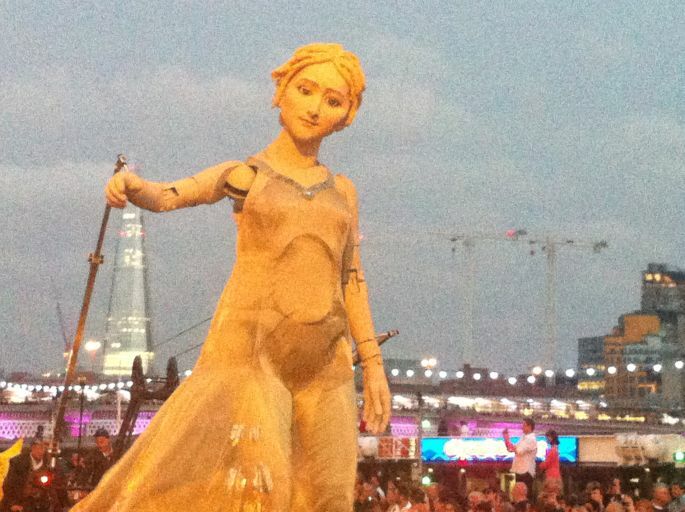 Thames Festival: What a great way to end the season!!! 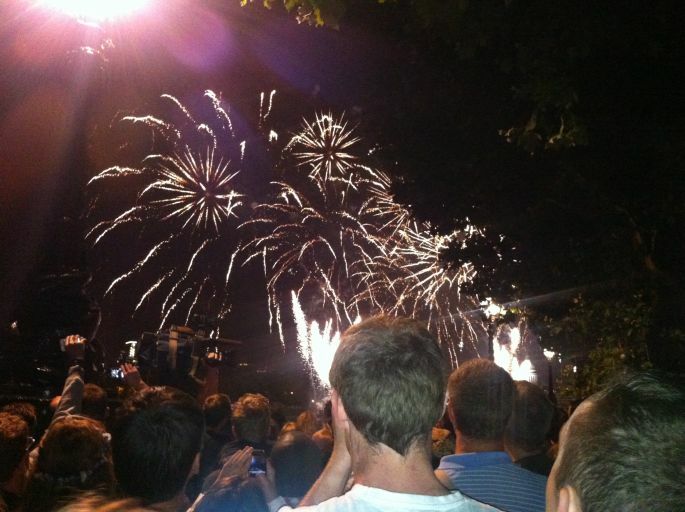 I went to the Thames Festival’s Night Carnival & Fireworks on The South Bank – a fantastic, lively, creative parade along the embankment, a magnificent fireworks display and a packed South Bank with a great Swedish circus act. I HEART LONDON!!! I knew my staycation would be non-stop but this was crazy! I hadn’t realised how much I have become accustomed to tempering the pace at which I operate, much as I do a lot with fitness, work, social stuff etc. Mark A Period Out In The Diary (Work & Home): Declare it a holiday zone – normal life-rules do not apply! Create a Staycation Itinerary: Plan as much activities as you can otherwise the days could fly by and perfect opportunities becomme missed ones. DON’T say “I’ll take it easy and see how it goes”. NAH!!! Do Everything in The Staycation Spirit: Make it your mantra! Do everything in the spirit of being on holiday! Others will cotton on and leave you alone or channel your staycation spirit too. You create your [staycation] environment! I did stuff to celebrate that I work hard and deserve rest & invigoration. When you take time off and are doing bugger-all, it makes the time go slow, the nonchalance increase, the dreaded doom of going back to work linger, more grey-clouds lurk over you…get the pciture??? I went back to work today one very invigorated, happy and rested man. This period had beeing a massive spirtual and phsycholigcal boost to the next year ahead. I surely wasn’t just “off work” for 2.5 weeks!!! I need to do this… So much to see and do in Bristol – are Demarco and Tiffany for hire?! G – Sounds like fun. Your such an inspiration, you know I will have to try it. Absolutely fantastic blog, you completely took me into the whole moment. Right now you have inspired and energised me to the point I just want to grab my bag, poncho and walk out of work into the world you just created for me. Staycation has definitely moved to the top of my ‘time out list’…thank you Gary. Gary – my God, I’m tired just reading all of this. I’m glad you had such a fantastic staycation. Be good, keep the blogs coming. I’m going to show this to the rest of the family. ***Top Tip*** Click on the ‘My Birthday Party’ & ‘Thames Festival’ headings to reveal video clips!! !